Brogue, One Of The Best Roguelike Games Anywhere, Comes To The iPad! Roguelike games are marked by four main things: randomly generated levels, permadeath , turn-based gameplay and (usually) ASCII graphics. They also usually have insane difficulty levels and absolutely unhinged gameplay mechanics that you simply can’t find in other types of games. 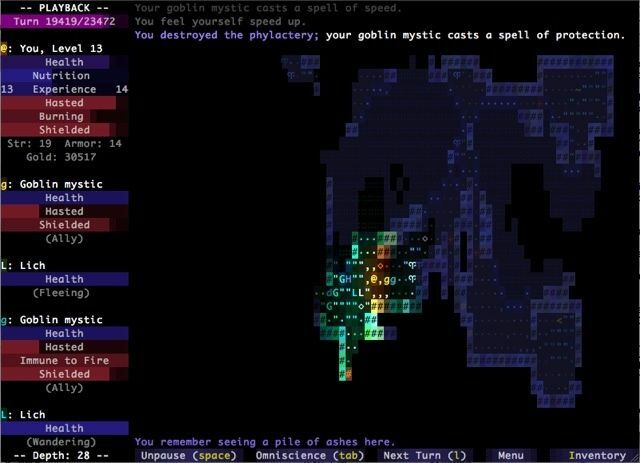 I’ve written about my unapologetic love for roguelikes before, but unfortunately, they’re very keyboard heavy games… and that means that the very thing I love most about them (their unhinged gameplay mechanics) tend to make them entirely unsuitable for playing on a touchscreen device like an iPhone or iPad. It seems, though, that one of the best modern roguelikes out there has successfully made the transition to the iPad pretty much unscathed. It’s called Brogue, and whether you’re an existing fan of roguelike games or someone who wants to figure out what the fuss is all about, this is a game you should play. Roguelike games call themselves that because they all owe their heritage to a wonderful little game released back in 1980 called Rogue. It’s a simple game by modern roguelike standards — the goal is to take your hero and delve to the 26th floor of a dungeon, recover the mythical Amulet of Yendor, then return to the surface — but behind that apparent simplicity is an intricate tissue of fantastical mechanics and emergent gameplay that still makes it utterly compelling. The idea behind the Brogue project is simple: “What if the original Rogue was continuously developed for 30 years?” It maintains Rogue’s adherence to a smooth learning curve, easily graspable core mechanics and ASCII graphics, but that’s where the similarities end. It’s an absolutely beautiful game that makes ASCII graphic look beautiful, dynamic and exciting again. Perhaps because Brogue is less complicated and keyboard heavy than most roguelikes, it makes a perfect fit for the iPad. In fact, you never have to open the keyboard at all, and it supports all of Brogue’s gameplay niceties, like auto-explore and even autoplay. Brogue only works on the iPad 2 or better running iOS 6, and to be honest, it’s a little slow. That’s not going to matter too much, because it’s a turn-based game, but there’s work to be done in this area. I don’t care, though, because as much as I love games like Sword of Fargoal, Cardinal Quest and Legends of Yore, this is the first truly faithful and uncompromised roguelike to successfully be ported over to the iPad. Now if only someone would do the same thing with Dungeon Crawl: Stone Soup. Brogue is free to download on the iOS App Store. You can grab it here or, if you prefer, you can download the Mac version to play here.